Recently my home school in Vermont allowed me to share some reflections on education in Norway and the US, as well as how I've worked, grown and been challenged during my year abroad. The following post was originally published in the Colchester High School professional development newsletter. As your school year is wrapping up in Vermont, my time here in Norway is rapidly coming to an end as well. I am looking forward to returning to CHS in August, and in the meantime I want to share a few observations and reflections from my year abroad. I knew a few things about Norway before moving here for a year; I knew it was a beautiful country, rich with nature, wildlife, impressive vistas, fjords and coastal villages—and great for skiing and cycling! I also knew that it had a small, relatively homogenous population of roughly five million. I knew that it was a social democracy, where healthcare and education are funded by high taxes and a publicly owned oil reserve fund. And according to the UN World Happiness Report, I also knew that Norway is ranked the happiest country on earth! I am sometimes asked what the biggest difference is between life in Norway and life in the US. Usually, I talk about social trust: I can leave my backpack while I use the restroom on the train and am confident it will be there when I return. Not once have I feared for my safety while out for a run, and if I get lost and have to cut through someone’s yard, there is a law protecting my right to do so. When I registered with the tax authorities, a letter telling me who my neighborhood doctor would be appeared on my doorstep just a few days later. My husband and I have joked that the biggest culture shock we experience is that in Norway, everything just works. So what’s it like to be a teacher or student in a country with such a high standard of living? Visiting over 100 different communities has shown me that, regardless of culture, political or economic system, there are opportunities and challenges—and schools illuminate many of these. Smaller student populations and a great deal of social trust allows for unique place-based learning experiences. In some schools students are out in the community regularly, visiting museums, hiking mountains as a class, sourcing local moose meat for the kantine, or swimming in the fjord during PE. As for some challenges, consider that such a strong emphasis on the collective rather than the individual might cause a teacher to prefer a “one size fits all” approach instead of a differentiated one. A reliance on the state for healthcare might mean that teens struggling with anxiety or depression fall through the cracks, as school social workers and guidance counselors are far fewer here, the assumption being that everyone has equal access through their doctor. A student with a unique talent or interest might shy away from developing it in a culture that tends to criticize individual success. And in an ethnically homogenous population, young new Norwegians face challenges to integrate into such a rigid collective identity. One hard reality on everyone’s minds is the decline of the oil and fishing industries. There’s acknowledgement that the country needs to diversify economically, and rein in boom-era domestic spending. At the same time, immigration is on the rise. At least 17% of Norwegians have some recent family history of immigration and the non-ethnically Norwegian population is currently growing faster than the ethnically Norwegian. I was surprised to learn just how segregated Oslo is: working class and low-income groups live primarily on the east side, while wealthier families traditionally live on the west side. In the east-side suburb of Haugenstua, for example, a school that Skyped with Jim Price’s geography class in December, the population is over 70% immigrant (almost all non-western), while my neighborhood on the west side is overwhelmingly white and ethnically Norwegian—less than 5% immigrant. As in our country, some Norwegians desperately want to protect their prosperity, and the security that provides for their future, leading to contentious political rivalries. Due to these changes, teachers feel the pressure to foster global awareness and empathy in the next generation. Some acknowledge that their students will need to be competitive in the international market. All teachers understand that in order to do so, they have to be proficient in English, which is why the Roving Scholar position exists in the first place. In my own reflections I often come back to the notion that, at least for now, the very purpose of education is different here. When I began visiting classrooms it didn’t take long to realize I was approaching school from an entirely American perspective. I was surprised to see that most teachers started their day with a cup of coffee and quiet conversations in teachers lounges, often by candlelight. I was frustrated and impatient when no one seemed to make a move for the classroom until after the bell had rung, teachers and students alike! I am sure some of my hosts wanted to suggest I relax a little. While my workshops ranged in topic, many students and teachers wanted to better understand American politics, the election of Donald Trump, and recently, gun laws in the US. I’ve been challenged to explain the ideological differences between political parties in the US and how Americans from diverse backgrounds might feel about issues like taxation, personal freedoms, racial and economic inequality and healthcare. I hope that by incorporating the voices of many Americans into my lessons I was able to give Norwegians a better sense of what it means to be an American today, and the unique challenge of perfecting a diverse union of more than 320 million citizens. In my after-school workshops, teachers were very eager to learn how American educators personalize learning and told me time and time again how inspiring it is to see how we incorporate student voice and choice into lessons, units and entire courses at CHS. I also shared how colleagues work together as collaborative teams, how we implement special education, and how grading, assessment, and reporting systems are evolving to communicate proficiency of standards. I have found that in some ways Norwegian schools are already doing many of the things we aim to implement in the coming years, yet in other ways their practices seem outdated and based in tradition rather than research. For example, academic grades and behavior grades have always been reported separately in this country, on a 1-6 scale. That’s right, the entire country uses the same scale on every assessment! However, even within schools and departments there is often little consensus about what each level of performance represents. Not unlike our faculty, Norwegian teachers want to better understand the role of grades as motivators. One major difference: I was surprised to learn that in Norway it is impossible to earn a failing grade. A student may earn a 1, but that student will move on. “Everyone can do something,” I have been told on more than one occasion. As you might expect, some of this has left me feeling confused, lonely, and at times misunderstood—but that’s really the entire point of this journey. I wanted to be forced to think about school in a whole new way, and I have. I think that many characteristics of Norwegian schools are clearly reflective of the strong welfare state, a belief in putting the collective before the individual, and high levels of social trust. I have been forced to remove my American-tinted glasses and see this work through a new lens, and the result has been one of the most rewarding experiences in both my professional and personal life. I am certainly leaving this year as a stronger educator, more thoughtful global citizen, and after living out of a suitcase for more than 150 nights, a MUCH better traveler! I cannot wait to see you all in August. Bike commuting to Oppsal skole for my very last school visit of the 2017-2018 school year. I knew that this last month of Roving was shaping up to be the busiest of my year here, but I had no idea how incredible the scenery, students, and teachers I'd meet during these four weeks would be. I was so lucky to spend 19 days traveling to some pretty remote places on the western coast, and to the far, far north one last time. Here are some stats for April: twelve schools, nine flights, six ferries, four buses, two moose sightings, and over 120 miles of exploring the coastline in my running shoes! Here are some images from the schools and towns I visited, which only begin to show the beauty of these regions. From south to north is Kristiansund, Averøy, Aure, Trondheim, Nærøy, Rørvik, Bodø, Roan and Osen, and finally, Vardø, in eastern Finnmark. The entire English department at Nordlandet ungdomsskole took me out on this boat (owned by one of the teacher's fathers) for a harbor cruise one evening! And I took the helm, briefly! An afternoon trail run in Kristiansund. A teacher workshop at Averoy ungdomsskole. The Atlantic Road. I was incredibly lucky to get driven out to the Atlantic Road by the school custodian, Jean, and her brother! Seter, from the ferry. I stayed at one of these fishing cabins on the pier for the night! Looking at images of the US with the entire 8-10 grade at Seter skole-- 4 students! The view from my fishing cabin accommodations in Besseker. Looking for patterns in "Snapshots of a Changing American Identity"
Learning where the 3-5 graders at Brandsfjord skole would like to visit in the USA. Flying in to Vardø, the easternmost town in Norway. Soccer practice under the Globus II radar. The northernmost fortress in the world! In the 17th century Vardø was the center of witch trials in Finnmark where 135 people were executed. Today a remarkable monument commemorates their lives. Running on the tundra at 31°E longitude, with over 20 hours of sunlight! The room closed in around me and my throat tightened. I was stunned. Shaken. I couldn’t speak. I suddenly felt entirely unprepared, unworthy of this cultural ambassadorship and put completely on the spot. Everyone is staring at me. I’m the only American here. I have to answer but I can’t speak. They are laughing at me. They are laughing at us. It’s been a while since I’ve cried in front of students. I can remember it happening only twice in my eight-year teaching career—once when I said goodbye to a beloved class of Advanced Placement history students and another time when I learned about a horrendous community tragedy through a news alert, while taking attendance online. In both situations I was surrounded by students I knew and who knew me. We comforted each other, and I felt safe revealing my vulnerabilities. But the security that comes with my school community in Vermont doesn't exist this year, and I surprised myself back in February when I broke down crying in front of students, to whom I'd introduced myself only five minutes earlier. So I tried registering the student’s question with an issue. Ok, gun control—go, and was about to launch into my response, the same one I’ve given countless times this year, when I realized what was happening in the auditorium: everyone was laughing. Finally I uttered the most human response I could muster: “Umm, why is everyone laughing?” And, just like that, the room of 60 fifteen-year-olds became impossibly quiet. “No, no I have not,” I said. “Uh, I have thankfully never been in a school shooting.” My throat was clenching. The student’s question, the causality with which he asked it, as though he were “checking just to be sure” made even more real for me the frequency with which our nation experiences these traumas—and the image this creates for the rest of the world. He wasn’t trying to be rude or funny, he was just curious, but his curiosity made others uncomfortabe. As far as he was concerned, a school shooting could have very well happened at my school. Standing in front of those students, grasping for words and answers, I felt a lot of things all at once. I was angry and sad and scared, and I still am. I was frustrated at the recurring nature of these events, and I still am. But, most of all, I felt embarrassed that my country hasn’t done more to end this—and I still am. Since the Parkland shooting, and following the widespread student activism calling for gun reform throughout the U.S. the topics of gun culture and violence are part of my daily Q&A with teachers and students here. I aim to provide honest yet balanced responses to their questions—all of them complex and many quite personal. Here are just a few of the questions I’ve been asked about guns and schools. Do you feel safe at your school? Do your students have clear backpacks? What would you do if a person with a gun came into your school? Isn’t practicing for this really scary? Do you have an armed guard outside your school? Do you feel safer knowing there is a police officer with a gun at your school? Why would someone joke about killing kids at school? What would you do, as a teacher, if your school told you that you had to be armed? To help me make sense of this country’s culture surrounding gun ownership, I've been asking the students a lot of questions, too. Norway, after all, is a country with a strong hunting and sport-shooting culture, and nearly one tenth of the population are registered gun owners. But this country has taken a strict approach to regulating gun ownership while still maintaining a citizen's right to own a weapon. For example, civilian gun ownerships is restricted to holders of a firearm permit, issued for the purpose of hunting or sports shooting. You must be 18 to own a rifle in Norway, and 21 to own a handgun. Firearms permits are only issued when a citizen has a valid hunting license or sports shooting license, both of which require extensive firearms safety instruction. Further, in order to qualify to keep a gun at home, an individual must keep the weapon, or parts of the weapon, in a locked and certified gun safe. More importantly, I wanted to know students' perspectives, so I recently gathered a group of willing students, posed some questions, and then sat back to listen and take notes. The remainder of this post features quotes from an after-class discussion I had with a group of tenth graders in a rural community in Nord Trøndelag. Three of them are older than 16, the minimum age to shoot guns for sport. When I asked the group who had at least one gun in their home, more than half of the group raised their hand. Who here lives in a house where there are guns? Tell me about the process you have to go through to get a gun in Norway. What have you heard on the news about guns and gun violence in the U.S. recently? How did it make you feel to read that some people in the U.S. have 10, 20, 40 or even more guns? What would you say to American high school students who want to see change? But wouldn’t some people here in Norway like to have them (semi automatic and fully automatic weapons)? As a gun owner/user, do you think that is a fair regulation? What would you say about the argument that kids don’t know very much about this issue, so they shouldn’t be protesting? Does anyone have a message for U.S. politicians? Spring has arrived in full force. I am so enjoying the warm sunny days, which are noticeably longer already. From Oslo to Bodø the ice has given way to crocuses, and I couldn’t be more thrilled. But spring also means that I’m now making my last visits for the school year. To try and capitalize on the best weather, I strategically scheduled a couple trips to more remote, coastal locations for the last few weeks of Roving. I have been looking forward to these all year. Last week I took my final trip above the Arctic circle. I had an invitation to visit the school on Helligvær, a cluster of islands about 25 kilometer north west of Bodø. The principal told me I had to come on a Thursday or Friday due to the ferry schedule, and that she would gather the 19 children who attend one-room schoolhouses on two neighboring islands for my visit. I was in. The ferry departed Bodø at 7am and made one stop on the island of Landegode, home to 45 people, to pick up five pupils. These children usually attend school right on their island, with two teachers. Today they’d come to the largest island, due to my visit. Then we continued on to Helligvær. The school on Helligvær provides an education for anywhere from 10-20 pupils, ranging in age from kindergarten to 10th grade, depending on the year. Currently, the entire island has a population of 90. There are four teachers and one principal at this school. The island has a grocery store that is open from 3:30-5:00, five days a week. Two mothers share the job of running the shop, and almost all of the fathers work on boats in some capacity. There is also a post office and a gas station, however the fuel is mostly sold to run farm equipment, as there are only four cars on the entire island! This 5-10 grade classroom overlooks the harbor, and is just across a path from the ferry dock. Each pupil has an iPad, the classroom has high-speed internet, AppleTV and a SmartBoard! We spent the morning here learning about a typical day in the life of a teenager in Vermont, and reading letters from American teens. We also learned about how the Norwegian government and NASA have been working together on space exploration lately, as they have been studying astronomy in science class. When the kids asked me if I had heard of their favorite take on dodge ball, I told them I had not. So, immediately we got up and went down to the gymnasium so they could show me how to play! This gymnasium is a new addition to the school and community. Before it was built a few years ago, physical education classes took place at a neighbors house. The high light of the day was when the kids took me on a walk around their island— without a teacher! It was a fun way to connect more informally, to practice their English (and my Norwegian!) and let them show me a little more about their lives here. Many pointed out their homes and animals along our walk. As we left the schoolyard and began to climb a steep, grassy path one pupil turned to me to ask if I would manage. “Yes!” I replied, and as I watched them all scurry up the hill ahead of me I realized just how much these kids really have grown up completely outside. “Growing up on a small island, they learn to do everything the adults do. Sheep, horses, the boats, and to be safe around the water too, thats the most important thing,” one teacher told me later. The town center on Helligvær island. The yellow building is the school. Tic-tac-toe tournaments in the school yard. When we left Helligvær at the end of the day, we made a quick stop at the third nearby island to drop off one student. As we waved goodbye to him the kids still on the ferry remarked to Hege that it was almost time... “Almost time for what?” I asked. I am so grateful for the unique experience of visiting small schools, particularly here on Helligvær. Talking with these students and teachers about school routines and growing up certainly gave me a new perspective on different school experiences around the world, but it also reminded me just how much we have in common, too. The last few weeks have taken me all over southern Norway. Truly basing myself out of my home in Oslo, I’ve had several school visits within a few hours train ride, allowing me to come home most night (or at least every couple days! ), cook meals for myself, explore some local attractions, ski in the Nordmarka, and generally recharge my batteries for a busy last few months of Roving. I can’t quite believe it— when I look ahead on my calendar I have only about twenty visits remaining, and I am rapidly approaching the 100 mark! Teaching about teen life in America continues to be a popular workshop topic, and I’ve had the pleasure of getting to spend an extended period of time with student groups at a handful of schools. In some small way, spending a half or full day with the same students replicates what I love, and miss, about teaching in Vermont— relationships with my students. With more time, we really get to know each other, the students become more comfortable speaking English with me, and it allows for a depth of content we just can’t achieve in an hour. A few weeks ago I travelled to Tønsberg to teach at an athletics school for the day. In Norway, some students opt into themed private high schools such as this one, but they aren’t really like private schools in the US. First, students pay a fee of around $2,000 per year, but these schools still receive over 80% of their funding from the national government. The teachers are on the same nation-wide contract as all other teachers in Norway, and are beholden to the national curriculum and exams. The main difference is that the school day is designed around the athletic clubs and teams students play for in the evenings. So, there are opportunities to train for a specific sport during school! Further, the cafeteria serves nutrient and calorie rich food especially for student athletes, and teachers readily accommodate the traveling athletes’ schedules. During my workshops with these students many chose to write letters to American students, explaining a little bit more about their experience growing up here and the way of life in this country. Check them out! This week I am visiting two schools in the Trondheim area. The following letters are from 8th grade students in Åsly. And finally, here are some pictures from my last few weeks of travels! Visiting Kristiansten Fortress in Trondheim. The days are getting longer! Students analyze famous photographs from US history in the workshop titles "Snapshots of a Changing American Identity"
A group brainstorm about the perceived shared experiences/values/interests of Americans. Markus, an 8th grade student, interviewed me about my life in the USA for his school newspaper. A student recommended after-school hike to Romsdalseggen in Åndalsnes. Taking advantage of some early morning light in Trondheim. Today I am heading home from a two week trip to Harstad, one of a handful of visits to schools I’ll teach at above the Arctic Circle. This trip, combined with trips to Hammerfest and Kirkenes before the holidays constitutes about a month spent in the “polar night." One of the unique aspects of living this far north (Oslo is at about 60 degrees latitude; Hammerfest is at 70!) is the very short length of day around the winter solstice. From late November through January, the sun never actually rises above the horizon! From late morning to early afternoon, when a bright blue glow stretches across the skies and reflects off the water and snowfields, it’s strikingly gorgeous. But the lack of sunshine wears on people, and everyone I meet copes in a different way. Some folks admit to being affected tremendously, saying its hard to sleep at night and they are groggy all day, feeling unmotivated and even sad. Others tell me that they’ve always known it to be this way, so it affects them very little. Of course, everyone knows that at the other end of the cycle the June skies will give way to the mid-night sun. So some tell me they’re happy to hibernate now and save their energy for summer. My method? A vitamin D supplement, cross-country skiing, and the Netflix series The Crown. But from what I can see, the darkness has little impact on school routines. Many schools still require that students layer up and go outside during their breaks. In Kirkenes I watched what seemed to be a very competitive lunchtime kickball game; the students weren’t deterred in the slightest by a few meters of snow. When I arrived in Harstad last week, a beautiful coastal city and the gateway to the famous Lofoten Islands, my host picked me up by bicycle. We’d gotten a half meter of fresh snow overnight, but that didn’t stop Jon from commuting into town on two wheels. We walked a few blocks to his school together, hopping over new snow banks and cinching our hoods down as the snowfall picked up. “So, you bike commute all winter?” I asked. ”Oh yes, I like to ride a bike,” he said with a shrug. Recreation and the outdoors are so obviously a way of life here and Jon helped me experience it fully, an outstanding host for my two weeks in Harstad. He and his wife Liv Marit had me over to their house for middag and served cod they’d fished out in the harbor last summer. On the weekend they took me cross country skiing in a breathtaking valley. Coincidentally, this day was the very first day the sun would creep to the horizon in nearly two months. When I approached the top of the groomed circuit, I joined a group of skiers to watch the blinding sun approach the horizon. For many, the return of the sun is an emotional experience. “You don’t realize how much you miss it, and when its suddenly back, it can feel overwhelming— I want to cry,” one teacher in town told me. I was also lucky enough to see the Northern Lights on a few occasions. Both in Harstad and Hammerfest, cold, clear nights brought the right conditions for viewing the solar activity from town. Approaching midnight is the best time to see them, so I bundled up with layers (and a bit of courage to wandering around above tree line in the dark by myself!) and set off following directions from my local hosts. One teacher invited me to walk up to her house on the outskirts of town, then follow her snow scooter track into the forest. From there she instructed “just keep going, and when you get to the reindeer fence just hop over. Then continue for about 15 minutes and you’ll get to the foundation of an old Nazi fortress. That’s a good place to watch.” It was. These trips to the North are a unique part of the Roving experience. As a tourist its unlikely that I’ll ever venture that far north again, so I'm taking advantage of every opportunity. This time in Norway is testing me in ways I hadn’t anticipated, especially on these trips to remote corners of the earth. I am being pushed out of my comfort zone, and while at times that feels uncomfortable, I know that that makes it just right. Thanks to Hollywood and Netflix, I sometimes feel like the image that Norwegian students have of American high school is a fictional reality somewhere between High School Musical, Thirteen Reasons Why and Mean Girls. "While there are probably elements of truth to some of what you see," I tell them, "American high school actually looks a lot more like your school than a movie." Part of my interest in spending a year as a roving teacher was to see the diversity of a school system across an entire nation. Now in the first week of December, I have logged around 50 teaching days and carried out almost half of the school visits I will make this year. I enjoy answering questions about a range of misconceptions about American schools, and American society in general. To this end I'm having fun sharing quotes, letters, pictures and videos from what American high school really looks like in Vermont and across the USA. Noon in December. Fjordtun skole, Rypefjord. I've taught at tiny schools on islands, accessible only by ferry, bridges and tunnels. I've taught on the ethnically diverse east side of Oslo, in affluent communities on the southern coast and in several schools above the Arctic Circle, including schools as far east as the Russian border! Over lunch, students tell me stories of seeing the northern lights on their walks home from school and how, in one fjord town, they can't wait to turn 16 because most of them will get a small boat that they can drive to school. Much of the lifestyle here is so uniquely Scandinavia. At the same time, these young Norwegians share many characteristics with my own students. Hanging out with friends, enjoying family time, playing sports, consuming social media, planning for the future and dating—this is what they tell me teenage life in Norway is all about. Common space at Presterod skole, Tonsberg. At the end of my workshops I always invite students to come up and ask me questions they may have been too shy to ask in front of the entire group. It’s during these conversations I often forget that I’m 3,000 miles from my classroom in Vermont—the anxieties and aspirations of teenagers seem universal. 1. Standing greetings: Before each lesson begins, students and their teachers remain standing and exchange hellos and a few words together before diving into the day's tasks. It goes a little something like this: "Good morning class. Good morning! I hope you're all doing well today; I am happy to see you! As you can see we have a visitor from the U.S. today. You may be seated." 2. Breaks: After every 45 min or so of lessons, students spend 10 to 15 minutes playing outside or in common areas-- as many as five or six times a day. At many schools teachers hold on to the students' cell phones all day in a “cell phone hotel” and encourage real play during break times, like a short pick-up game of soccer or foosball or just jumping around with friends for a few minutes. And during this time, someone always opens a window to let in a little fresh air, even in December. Students relaxing during a break. Breilia skole, Hammerfest. 3. School shoes: Students and teachers have specific indoor shoes. In many towns, students walk or ride their bikes to school and keep a pair of slip-ons in their classrooms to change into when they arrive. Usually they are clean tennis shoes or sandals like Birkenstocks with comfy socks. 4. Classrooms: Students stay in the same classroom with the same classmates all day long, and the teachers rotate to the students. Norwegian students are very surprised when I tell them that, in American high school, a student’s schedule is unique to the student, and they move all around the building throughout the day. Students here also eat lunch in their classrooms, and everyone brings a small tin or plastic box with bread and pålegg, which are the toppings for a open-faced style sandwich. Fruit and yogurt are common sides. Students giving an oral presentation. Fjordtun skole. 5. Sports: Sports are played on private teams, not at the school. Many Norwegian students are athletes; handball and soccer are extremely popular. But all sports happen in the evenings on local town teams rather than with school teams, and seasons are the length of the school year. Students pay fees to participate and get to know kids from other schools through sports. A student showing off her handball team sweatshirt. It can be really tempting to visit a new place, make a few observations and quickly become a believer in a new system— especially in the happiest country in the world. Free higher education? Yes please! Universal healthcare? Sign me up! But one thing I try to emphasize everywhere I go is that comparison-making is not for the purpose of determining which country is better; it instead helps us stay open minded to a different way to doing things. In this way we learn from each other’s successes and shortcomings, making small changes toward progress rather than blindly adopting the latest and greatest. Seeking to understand how things are done in another place turns us into global citizens. Being surprised or even startled by cultural differences helps us think critically about our own norms and compassionately about the lives of others. It develops “the wonderment muscle” and just might lead to new ideas about how to make wherever you call home a little nicer. Commuting on the ferry in Arendal. Learning Norwegian from my host's five year old daughter! A late fall after school run in Tvdestrand. Reading letters from students at Colchester High School in Arendal. A weekend in Hammerfest, the northernmost city in the world. Creating Dream collages. Flatestad skole, Oppegard. Tonight, as I was buying my bus ticket, fumbling with the credit card machine, my luggage and directions, the driver could tell from my accent that I am American. "Which state are you from?" he asked enthusiastically. I told him Vermont, to which he replied, "Ah yes, and your state capital is Montpelier!" I was a bit taken aback that this man in Bodø, a small fishing town above the Arctic circle, knew not only where I am from, but the state capital to boot. "American, huh? That president of yours is having a rough week." I nodded in agreement and knew next question was coming: "So, what do you think of him?" And so it goes. In almost every single classroom, at dinners with teachers and new friends, and on public transportation, it's the same question everywhere: What do you think of Trump? Overwhelmingly, Norwegians have a negative view of President Trump. When students ask me what I think, I first ask them about how they think he is portrayed in the Norwegian media. Answers range from "incompetent" to "arrogant", and only occasionally do students cite specific criticisms of his policies. In December 2016 the Norwegian newspaper VG published a cartoon of Trump as a baby in a soiled diaper, pulling at an American flag tablecloth, the a globe atop the table tipping precariously. They imagine a dangerous and unpredictable man in the White House. With this image looming, Norwegians desperately want to know how and why he appeals to so many Americans, and how he was able to win. More often than not I feel like I fail to deliver a concise explanation. In the words of former rover John Hanson, "Too often I cannot give an answer. Responses I can offer, but answers have been few." Parliamentary elections were held in early September here in Norway, and classroom walls displayed the research projects students had done on various candidates- from eight major political parties in all! I asked teachers if they tell their students who they are voting for, and their answers varied. Many said they at least told them how they personally feel about some issues. One teacher replied, "I told my students who I am not voting for." I wrestled with the knowledge of these cultural norms and how they should inform the degree to which I share my views. In my teaching job at home I regularly use current events to teach about the past. It's one of my favorite things about teaching: helping students analyze facts to think critically about issues that affect Americans across the political spectrum. I enjoy teaching students to use their knowledge of history and understanding of diplomacy to look for patterns over time. I remind them of checks and balances, requiring that they read primary sources and consider issues from multiple perspectives. Together we compare and contrast documents to identify reflections in attitudes and policies from eras gone by. And I coach students in identifying their own biases, and confront intolerance when it creeps into the classroom. But did I tell my American students who I was voting for last November? I did not. A discussion of how I vote has no place in my American classroom. But this year is different. In the classes I teach here in Norway I say very clearly, "I did not vote for Donald Trump." But I side-step the emotion-laden question how do you feel about Trump and I provide my perspective on the policy agenda he proposed and is working toward. If we're going to talk politics, this is the requirement: we stick to the issues. Here's the gist of what I say: I did not vote for Trump for several reasons. I'm really concerned about the cost of heathcare in my country. It's just too much and too many people live in fear of getting sick or injured. You might also know that in America college is very expensive and student loan debt is crippling my generation, so I want to vote for a candidate with a plan to make college more affordable. I also want America to be a safe place for minorities and new Americans. Part of what makes America great is that we're a diverse nation of immigrants, and I believe we can continue to allow people from all nations to seek safety and make a home in America in a way that protects our national security and keeps our economy strong. We do not need to build a wall to accomplish that. And I believe that we should work with other nations to find solutions to global problems like climate change and terrorism. I tell them who I voted for to foster a bigger conversation about the policies that affect Americans because that's just not coming through in Norwegian media. But it's not an isolated phenomenon. In the 2016 debates Hillary Clinton and Donald Trump spent less time discussing policy than Barack Obama and Mitt Romney did in 2012, and they spent less time on the issues than Obama and McCain in 2008. We're satiated by the latest breaking news, and I am afraid that we fail to dig much deeper than soundbites and headlines. Sure, the media has a responsibility to tell the truth, debate moderators must be fair and balanced, but average Americans, myself included, ought to share in the responsibility as well. We control the discourse in our homes, churches, book groups, social media, and yes, even in our classrooms. We can choose to be distracted by the latest superficial scandal, or elevate the issues that undoubtedly will impact our realities. Here, I'm trying to do the latter. I've wonder how Senator William J. Fulbright would respond to the questions I'm asked in today's political climate. In returning to the very purpose of this program, as he said it, I think he would support my decision to be candid. One purpose of this grant is to help Norwegians put a real face to America and add breadth and depth to their understanding of American history. For example, most Norwegian students are surprised to learn that Hillary Clinton actually won the popular vote by over 2.5 million votes! Providing counter narratives has been a crucial role of Fulbrighters since 1949 when the program began, but I think it's critical at this moment in history. We are living in a time when the experience of 300 million could easily be deduced to a headline or a tweet. If we allow the extreme, clickbait-worthy to define us, we are bound to be misunderstood. Ultimately, this is the beauty of teaching history-- there are rarely answers. The learning is in the thinking and imagination, in cultivating empathy and practicing critical thinking, which is the very purpose of my workshop on the 2016 Election. In order to think from the perspective of Americans, I have Norwegian students view three campaign videos, one from each of the major candidates, plus Bernie Sanders. While we watch the videos students consider the following: Who is the video speaking to? What specific issues is the video addressing, and what is the picture of America portrayed by this candidate? What is the tone of each video and how does that impact your feelings toward the candidate? From there, students do independent research by candidate and issue, in order to think more deeply about why each candidate might be appealing or concerning to Americans from all walks of life. To end, I ask students to choose a candidate and write him or her a short letter explaining why he or she would, or would not, get their vote. Below you can scroll through examples of what my Norwegian students have said. Still, it can feel strange to discuss my political views so openly with these students. My aim, however, is to present an accurate and balanced portrayal of why each candidate was appealing to Americans, while at the same time being candid and honest about my own experience. All in about an hour and a half. It's not easy. If you are an American student, colleague, or friend reading this I hope you will help me. Please consider sharing your perspective on the current state of American politics, perhaps more specifically how your personal life experiences shape your views. What policies are concerning you right now? What should our country do about our nation's most pressing problems? How have you been impacted by the 2016 election and the presidency of Donald Trump? I want my work here to reflect a range of American voices, not just my own. Regardless of where you sit on the political spectrum, please, please share if you can. What's your favorite thing about the USA? Do you own a gun? Did your school change when you got a new president? Why is college so expensive in America? These are just some of the insightful questions I've received from ungdomsskole students at the schools I have visited so far. In the last three weeks I've made eleven official Rover stops, including a college class at the Ostfold University and the European Foreign Languages Day conference in Trondheim. To say that I am enjoying my travels would be an understatement. I am routinely reminded what huge honor and privilege this job is, as I have been warmly welcomed by students and teachers everywhere. Typically, a school visit involves arriving at the school at the beginning of the school day (which might require a flight and/or train ride the evening before), meeting with the host teacher and his or her colleagues, and setting up the classroom. My workshops can be as short at 45 minutes, or as long as the entire morning or afternoon. My most popular workshop offering so far has been "Teenage Life in America: A Day in the Life of Generation Z." In this workshop students compare teenage life in Norway to teenage life in America. Norwegian teens are interested to learn about the typical school day, sports, and traditions like Homecoming and Spirit week (they are shocked by the 'we've got spirit, yes we do cheer!') They seem to be amazed by all of the options students in the US have to pursue their passions right at school. In Norway, by contrast, all sports and clubs are private, so students and teachers go right home at the end of the school day before heading to practices or rehearsals in the evening. Last week I taught my workshop on The American Dream to twelve students at Snasa Montessoriskole. This school follows the Montessori method, but receives 85% of its funding from the Norwegian government, and teachers adhere to the national curriculum. Montessori is simply an alternative in teaching method and environment, and anyone easily can opt-in. We spent the entire morning talking about dreams for the future, why a person might have to put their dreams on hold, and how in some places in the world its easier or more difficult to pursue your dreams. The students told me that a person's ability to achieve their dreams might be impacted by the leaders their country has elected, how much support a person receives from their family, or if their county has a good "safety net" like Norway. Students create a collage of their unique Norwegian Dream! They often include what they'd like to be when they grow up, as well as quotes and images that convey their values, like equality, respect and safety. Hearing their perspectives, I couldn't help but compare their responses to how my students in Vermont might answer the same questions I was posing. In the course I teach at Colchester students might say things like "it would be easier if you started out from a rich family," or "it might be harder if you're a minority" or even "if you're are willing to work really hard, anything is possible." While Norwegians are fascinated by life in the United States and eager to travel there, I'm also struck by how utterly incredulous they are when I explain things like the cost of higher education and healthcare, as well as our child leave policies. I remind students and teachers that the US is a huge, diverse country of over 300 million people. Additionally, our relative new-ness (by contrast, Norway is one of the oldest continually functioning democracies in the world), entrenched two-party system, and system of federalism makes the adoption of cohesive, basic national policies very challenging. But truthfully, its a little hard for me to read this quote because I know it's not reflective of every American's experience. On the one hand, I agree with Petra; she beautifully articulates the American ideals of upward mobility and the pursuit of happiness. When I am feeling particularly prideful, this is the America I imagine. This is the America I desperately want for my students; its what motivates me professionally. But at the same time I wonder, WHO really has the right to be different? WHO is told they can be anything they can dream up? WHO feels like they have endless opportunity? Petra's quote, in all of its hope and assuredness of what it means to be a teen in America, is at the same time a poignant reminder to me of the achievement gaps that still exist in American schools-- in my own school. Ensuring equitable learning experiences in US public schools is one way that we move closer to this shared vision, and it is work I miss about my job back at home. This week marks two months in Norway for me. Routines are being established and my Norwegian is getting better with each day. One way I've been practicing is to have the students help me with greetings and goodbyes. They get a kick out of my American pronunciation and the fact that I cannot roll my tongue. But today, without having to ask for help, I successfully ended my lesson with a confident "Takk for mag og ha det bra!" The next morning, after waking up to frost on our tent walls (on Sept. 4th!) we took a ferry all the way to the end of the lake, then walked back over two days. We spent one night at a DNT Hut, enjoying waffles at our arrival, warm showers, and dinner cooked for us by the hut staff-- luxuries of the back country we are not accustomed to! Of all the gorgeous places we have hiked, this route is near the top of the list. The views were consistently breathtaking over the entire traverse. The photos below only begin to capture the relentless beauty of this region. Enjoy. Every August, teachers in the United States can count on a few days of intense professional development before the students return. At my school in Vermont, these "PD" days have recently included work with transforming standards into proficiencies and learning targets, ensuring equity for all students regardless of ability and identity, and personalizing learning. This year, my inservice is a crash course in Norwegian culture and education. This past week I attended a two-day retreat put on by the Norwegian Centre for Foreign Languages, a branch of the Norwegian Ministry of Education. The chair of the centre welcomed us by explaining that "in Europe we know that in order to have functioning democracies we have to understand each other." And so, the Centre has partnered with the Fulbright foundation to bring three American Rovers to Norway each year (and its the only country in the world to do this). My grant is a result of the Norwegian government's investment in language education, so while I'll certainly be teaching about American history and culture, I am also expected to give students the chance to practice their English, as it is the first required foreign language required of all schoolchildren. Almost all Norwegian teenagers take a second foreign langue as well, for a total of three languages. There are about 40 languages being instructed across Norway! Some of the major questions I posed in my application for this grant surround the Norwegian national curriculum and its implementation through competencies at the Lower Secondary and Upper Secondary levels. In short, I am curious how, in a comparatively much smaller and more homogeneous place than the United States, to what extent do teachers have autonomy within the national 'Core Curriculum'? In Norway there is one nation-wide assessment for reading, math and English, given at the end of years 5, 8 and 9. School funding and teacher salaries are in no way tied to performance on these tests. All funding comes from the federal government. Student test scores are purely to be used as diagnostic and to improve instruction. In some cases the scores are reported in communities and create a reputation for the schools. They are reported to the student and families, but never submitted to Universities. On exams and in classes, grades are reported using a 6 point scale. My next questions include: What does a grade mean in different classes? Is there a scale? How are scales developed? How often? Are grades averaged? What counts toward a grade? Alas... I have a lot of questions about grading... Is there a head exploding emoji on this Norwegian keyboard?! Ungdomskkole: I will serve as the Rover for ungdomskkole, which is the Lower Secondary school, or ages 13 through 16. All classes are heterogeneous. In fact, what we call "tracking" is prohibited in Norway, and teachers are expected to differentiate to the diversity of readiness levels in their classrooms. I am very much looking forward to seeing differentiation in practice in the schools I visit. Ungdomskkole is compulsory, and has a near 100% completion rate. After ungdomskkole, students choose if they would like to pursue traditional or vocational upper schooling from ages 16 to 18 or so (depending on choice). In a traditional track, students will apply to University at the end of upper secondary school. Applying to University: When students apply to University they simply submit their Upper Secondary grades on a nation-wide common application. On the application they list what they would like to study and where. Not much more. No college essay, no letters of recommendation, no resume with endless extra-curriculars. Just grades. Of course, we had tons of questions about what we should expect from the Norwegian students in terms of academic interests and behavior. I wanted to know, "what major cultural differences between the US and Norway do you think we'll see play out in the schools?" You should not believe you are anything. You must not believe you are as much as us. You should not believe you are wiser than us. You should not imagine you are better than us. You should not believe you know more than us. You should not believe you are more than us. You should not believe that you are doing anything. Do not laugh at us. You should not believe anyone cares about you. You should not believe you can teach us anything. And so, in a Norwegian school I am told I should expect to not see academic achievement ceremonies, no "star of the week" boards, generally less fuss made of individuals because Norwegians are not so interested in being in the spotlight as the "best" at something. Sometimes, this means students are timid and shy to participate. When I asked "How do teachers motivate students? How do you celebrate academic excellence?" a smile came across the presenter's face, and I could tell I'd asked an entirely American question. "Lots of certificates of participation" she only half-joked. I wonder how this aspect of Scandinavian culture is reflected in public education. And how, perhaps, public education teaches this aspect of culture through a hidden, ethical curriculum. Pedagogically, I am eager to see how teachers really use their national standards-- do they drive instruction or are they shelf documents? What accountability systems have municipalities and schools developed to track student progress at the lower secondary level? Do school communities have vertically aligned learning sequences between ungdomskkole and upper secondary? How do schools provide equitable experiences for all students, including those with learning disabilities? What is standard practice for modification of standards? Further, what are student attitudes about learning, when it seems like so much is left to intrinsic motivation? How does the fact that their grades alone determine university admission impact the student experience? And what role does janteloven really play in schools? What is its effect on building self-confidence and assurance in young people- young women, especially? Luckily, I have a year to begin to dig into some of these questions. I'm already fascinated by "the Norwegian way." Which is to say, their emphasis on community, the gentleness in human interactions, and the ethical code which seems to drive everything from the intense rubbish sorting everyone is expected to follow, to the beautifully maintained trails of the Nordmarka. So what's in the water here? Or more accurately, what's in the schools? Settling into a new city and completely foreign (urban! European!) lifestyle has made for a fast-paced and enjoyably exhausting first week in Norway. A week ago we left Boston packed to the gills: two bike boxes, two ski bags, a couple large duffels of clothing and backpacks. A day later we found ourselves in our new home, a little apartment in the Bislett neighborhood of Oslo. It couldn't be any more opposite from our home in Vermont-- which is to say, it is perfect: bustling with people, a coop grocery store a stones throw away, a cafe on the corner, and busses whizzing past. Different, sure, but exactly what we came for. A fresh, exhilarating and challenging new perspective on life and work. Knowing us, it's probably not surprising that our vehicle of choice for acquainting ourselves with our new neighborhood is bicycle. One thing we immediately noticed about Oslo is the incredible bike lanes, as life in this city so obviously revolves around a shared passion for the outdoors. 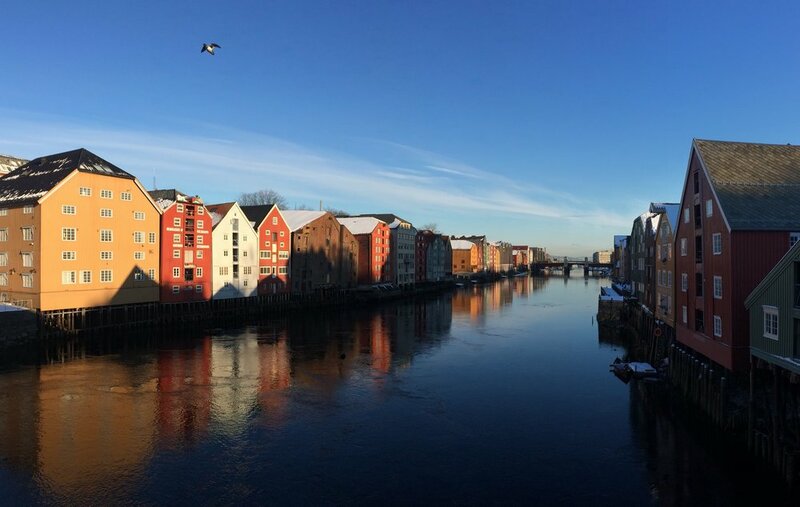 Cyclists, runners and skiers enjoy easy access to recreational opportunities right here in downtown Oslo as well as a short train ride (like, 10 min) to the outskirts of the city where the real magic begins. So the bikes emerged from their boxes and were assembled in no time. A 1,200 km network of gravel roads (cars are not allowed) weaves around countless lakes just a short ride from our apartment. We rode 55km yesterday and just scratched the surface. Additionally, huts serving waffles and other treats are scattered throughout the forest. And much of the area is lit and groomed for nordic skiing in the winter. How did we land here, again? I am continually reminded how lucky I am to have this travel (er, well, life) companion. We've been able to explore three separate regions of Oslo given Tyler's knack for piecing together heat map data and loading rides onto his Garmin, helping us avoid high traffic areas and weave bike paths together with an ease that would otherwise be utterly impossible to new-comers. Additionally, a public transportation ticket allows you to visit several islands in the inner Oslo Fjord. We visited Hovdoya, Lindoya, and Langoyene. While this first week in Oslo has certainly been filled with lots of play, I am anxious to begin my real work as a Fulbright grantee. Collecting resources for workshops and beginning to schedule school visits has put that familiar fire back in my belly. Honestly, I wonder every July if it will come again, this yearning to return to the classroom. And this year, knowing I will not be returning to my teaching job, I was wondering where and when I'd start to feel that excitement for the first day of school, for new faces and lessons. Well, I think its here. Tomorrow begins a few days of orientation, both here in Oslo and an overnight in Halden at the Centre for Foreign Language in Education. Having the opportunity to collaborate with new colleagues and learn more about the education system I will be working in this year are the top priorities for the days ahead, and I am ready. Today I took a day trip to Fredrikstad, a well-preserved, fortified town about an hours train ride south of Oslo. I travelled with Brie, another American Fulbright grantee, and as we strolled back to the train station at the end of our day, we found ourselves overcome with gratitude for this rare opportunity to do such unique work for a year. In just a week I can tell that this country is something unlike anywhere I've visited or lived. In these peoples' stewardship for the land and progressive attitudes I see reflections of my home state of Vermont. But in the fullness of their contentment, how it seems to transcend occupation and stage of life, this initial impression leaves me with so many new questions. And so it's time to go to work as a Roving Scholar in American Studies. What does that mean? I'll be visiting schools in diverse communities across Norway for the entire school year. I'll be teaching my workshops and engaging in professional development with Norwegian educators. If schools are the heart of communities, I want to experience the entire pulmonary system, starting at the source. And yet, I feel the weight of my responsibility at this time when my country is shining a light into some of the darkest places I teach about. Yes, I am certainly filled with uneasiness and my heart aches as I prep and read, watch and listen; as I re-work, re-read, re-think and re-read some more. But for the values that led me to this profession, for the reasons I can stand up in front of my American students and tell them "In no other country on earth can you..." I am eager to begin roving. American is so much more than it's government, and certainly more than any administration. I am honored to represent my homeland and my profession, maybe at this time in history more than ever, as we sift through our distinctly American past and struggle, again and again, and then some more, toward The Dream of e pluribus unum. For the last few months we've been eagerly anticipating our year in Norway. Between preparations to leave my teaching job for a year and planning personal adventures we hope to take while we are abroad-- its been a hectic and exciting time.